Osmotics - Osmotics blue copper at DrSkinSpa.com. Launching many “firsts” seems to be secondnature to Osmotics Cosmeceuticals’ founder and owner, Francine Edmund Porter. Since 1993, Porter has shaken and then renovated the anti-aging skincare industry with her desire to provide serious anti-aging skin and hair care products to produce serious results. Osmotics Cosmeceuticals works with world-renowned scientists and leading university medical and research centers to incorporate the latest breakthroughs and provide the most advanced thinking in the skin care arena with clinically validated ingredients and technologies. 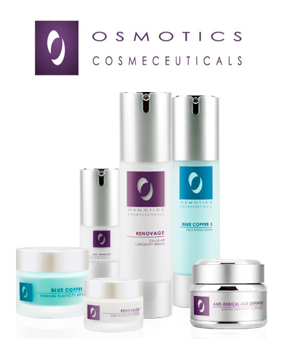 DrSkinSpa.com is an Authorized Retailer of Osmotics. All Products are Guaranteed Authentic & Fresh. Osmotics Blue Copper 5 Firming Elasticity Repair cream features the first anti-aging product to incorporate copper peptides. Developed in 1997, this clinically proven technology is based on the fact that copper has been used extensively for years to heal wounds. Backed by a significant amount of scientific data, copper increases firmness and elasticity in the skin. The Osmotics Blue Copper 5 repair cream combines a new anti-aging molecule, the collagen-boosting five-chain pentapeptide, with the benefits of copper. Various forms of copper have been used since the beginning of mankind for healing. Copper is a powerful antioxidant, especially when combined with vitamin C, and fights free radicals to keep skin healthy and youthful looking. Osmotics Blue Copper 5 products hold title as Allure Magazine’s Editor’s Choice Award winner. “Osmotics Blue Copper technology for non-surgical lifting is based on groundbreaking technology used by NASA that utilizes wavelengths of light to improve overall skin tone and radiance. Our customers are excited by the Osmotics Blue Copper products because they offer such new technology with proven results,” stated Dr. Farid Mostamand, founder and owner of DrSkinSpa.com. Osmotics Blue Copper 5 Face Lifting Serum combines the benefits of copper peptides with the most advanced lifting technology available. Osmotics Blue Copper 5 Face Lifting Serum contains almond proteins for smoothing, lifting and toning, along with shitake mushroom extracts to aid in the skin’s support structure to help prevent sagging and thinning. Osmotics Cosmeceuticals introduced FNS (Follicle Nutrient Serum) as the first product backed by a double blind clinical study to show improvements in hair loss for women and men. Osmotics Cosmeceuticals FNS vitamin enriched formula uses natural ingredients to safely promote healthier, thicker hair. FNS products include Osmotics Cosmeceuticals FNS Revitalizing Shampoo, Osmotics Cosmeceuticals FNS Revitalizing Conditioner, and Osmotics Cosmeceuticals FNS Nutrilash Brow and Lash Enhancer. Osmotics Cosmeceuticals FNS Nutrient Serum was named Breakthrough Product of the Year by Allure Magazine in 2002. Osmotics Cosmeceuticals Anti-Radical Age Defense Barrier Longevity Complex emerged in 2007 as the first skin defense formula to fight all three forms of free radicals: ROS (Reactive Oxygen Species), RNS (Reactive Nitrogen Species), and RCS (Reactive Carbonyl Species) with patented BRT (Barrier Repair Technology). I am so satisfied with the service and products that I have received. I had to talk to one of the customer service people named Rachel was so attentive and helpful. She also recommended that I talk to their esthetician so that I could get a better understanding of my type of skin and what I should be using. It worked! What a great way to purchase products. I love it!